With Miami down 14 points with six minutes remaining, it seemed the Hurricanes were going to suffer yet another loss because of a slow, disappointing second half. But UM’s freshmen had other plans. 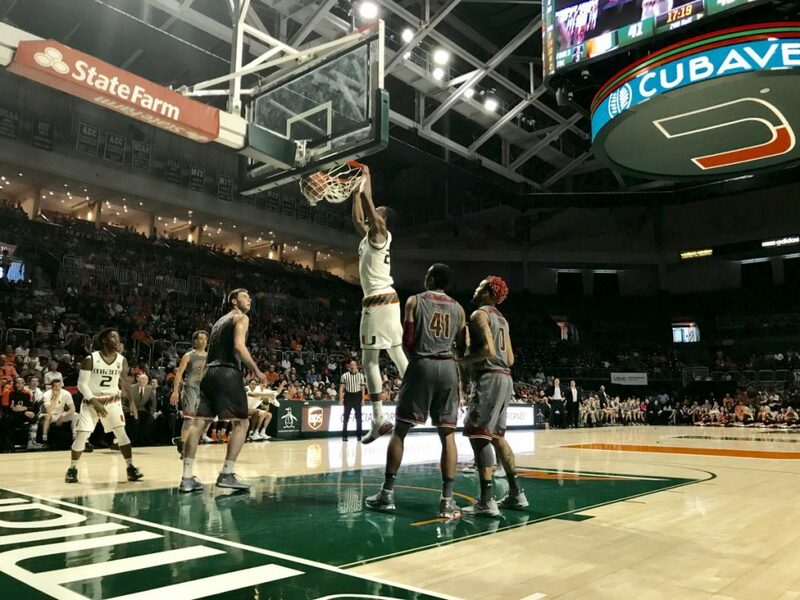 Chris Lykes scored 11 of his 15 points in the final four minutes, and Lonnie Walker IV made the deep, game-winning 3-pointer with 2.4 seconds left to lead the Canes to a comeback 79-78 victory over Boston College Feb. 24 at the Watsco Center. ICE. WATER. IN. HIS. VEINS. Despite giving up 57 percent shooting to the Eagles, the Hurricanes (20-8, 9-7 ACC) held them scoreless in the final 2:54. Meanwhile, Miami made four of its last five shots. BC (16-13, 6-10 ACC) was rolling, and UM had no answer for the dynamic backcourt of Ky Bowman and Jerome Robinson. The game looked close to over, and Miami had already suffered a period of nearly five minutes without a field goal. Then Lykes flipped the switch. The 5-foot-7 guard led the Canes attack with a handful of contested layups and forced the Eagles into late fouls and turnovers. Late in the game, Lykes often took hard falls onto the court after getting fouled while driving to the basket or drawing a charge. And then when UM found itself down two points in the final seconds, Walker took the game into his hands. When he saw big man Luka Kraljevic switch onto him, he knew exactly what to do. Walker totaled 14 points on the afternoon. Sophomore Dewan Huell scored a team-high 16 points and pulled down nine rebounds. Robinson finished with 30 points, and Bowman scored 15. Sophomore forward Nic Popovic added 17 points. Miami has won two in a row and have two games left in the regular season before moving on to the ACC Tournament. UM currently ranks No. 6 in the conference out of 15 teams. The Canes hope to prove worthy of an NCAA Tournament bid in mid-March. As of Feb. 24, ESPN is predicting UM to be a No. 9 seed. The Eagles have lost their last three games and their chance for a tournament bid looks slim-to-none at this point. The Eagles led 41-39 at halftime. Both teams were red-hot on offense – BC shot 66 percent in the first half, and UM shot 53 percent. Miami out-rebounded Boston College by 12 and hit 13 of 15 from the free-throw line. Boston College, one of the best free-throw shooting teams in the country, hit just 14 of 25 from the line. The last time these two teams met, the Hurricanes blew a seven-point lead late in the second half and lost 72-70 off Bowman free throws. This time, Miami reversed the trend. The Hurricanes will try to win their third-straight game in a matchup against No. 9 North Carolina in a 9 p.m. start Feb. 27 in Chapel Hill. Miami has just two games left with the ACC and NCAA Tournaments nearing. Boston College next faces Syracuse in a 9 p.m. matchup Feb. 28 at the Conte Forum. Freshmen Lykes and Walker have guided the Canes in ACC play since the injury to Bruce Brown Jr., who is still out with a broken bone in his foot, and it seems their responsibilities as leaders only continue to grow. Walker is averaging just under 14 points in conference play while Lykes is scoring more than 11 points a night. Both players, particularly Lykes with his high-motor and aggressive style of play on both ends of the floor, have had moments when they have single-handedly rejuvenated Miami’s offense in games in which it seemed like no one could buy a shot. After putting forth what coach Jim Larrañaga called the “best performance of the year” against Notre Dame, Miami went back to the same starting lineup against Boston College: Ja’Quan Newton, Lonnie Walker IV, Anthony Lawrence II, Dewan Huell and Ebuka Izundu. This is the second consecutive game the Hurricanes have utilized two big men in the starting rotation after playing the majority of conference play with four guards in the lineup. Latest timetable on Bruce Brown Jr.
Larrañaga said in a press conference Feb. 23 that sophomore guard Bruce Brown Jr.’s foot injury will be re-evaluated March 12, and he is expected to miss at least the ACC Tournament. The Canes hold a record of 6-3 without Brown in the lineup. In the meantime, Larrañaga said sophomore DJ Vasiljevic has taken on a leadership role on the court since Brown went down. Yahoo Sports reported Feb. 23 that ASM sports agency and agent Andy Miller distributed illegal payments and loans to more than 25 current and former Division-I basketball players. The payments go against NCAA rules and how the organization deals with amateur players. Players from schools such as Duke, Michigan State and Kentucky were named. Miami was not one of the programs mentioned in the report.